Go See This Sports Bar by Selecting "Sign NDA" to the left! Unique Tavern with Sports Bar & Full Kitchen. This Sports bar features one of the coolest looking places in town as well as it is nearby the water making it even more attractive. The food is great and the business is waiting to get new blood to grow it. There is a nice size bar for patrons. This sports bar serves an array of premium cocktails while wine and beer is offered. Reviews state the business has a great atmosphere and comfortable seating. There is a nice partially separated lounge for sports and another dining area make this restaurants character casual, comfortable & fun. Menu includes appetizers, breakfast-on weekends, lunch & dinner...American Pub fare with salads, sandwiches, burgers, steaks and some seafood as well. Nothing too complicated...just fresh quality ingredients. 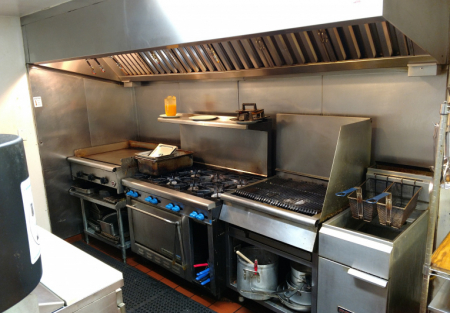 Fully equipped kitchen with Ansul Hood System, 8 burner stove, fryer, salad station, flat top...and much more! 11 TV's, surveillance system, safe, Seating-high tops, low tops & bar seating, plenty of A/C, POS system with 2 stations. Added value with ATM & Juke box revenue share & rental income from storage facility in rear of lot. This sports bar has a patio as well! Great Value for a person looking for a bar with kitchen. Reason for selling: Owner has moved out of the area.